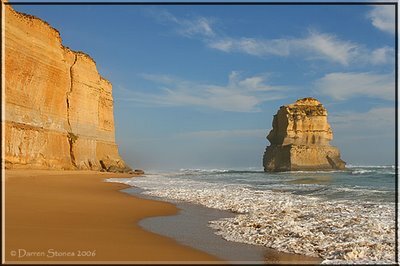 Most visitors to the Twelve Apostles in Victoria, Australia, will look down towards Gibson’s Beach and probably think it’s a spectacular looking spot without even contemplating a walk along it. Rest assured it’s worthy of traversing the narrow steps to gain access to the beach for a close encounter with the fierceness of the Southern Ocean. Located within the Port Campbell National Park, Gibson’s Beach is not a good spot for a swim or even a good place to wet a line. In fact, on many occasions it’s a downright uncomfortable place to visit due to the howling wind and sea spray. When the conditions are friendlier then a walk from Gibson Steps to the far westerly cliff face is an invigorating experience which is sure to refresh the mind. Upon arriving at the car park at Gibson’s Steps, you’ll notice a magnificent vista before your eyes – the waters of the Southern Ocean. A quick look from the top is always a good place to start and then head on down the steps to the beach below. The steps were originally carved into the rock by Hugh Gibson, original owner of the nearby Glenample Homestead. Once at the bottom you’ll be mesmerised by the sheer cliffs and the sounds of the ocean reverberating off them. 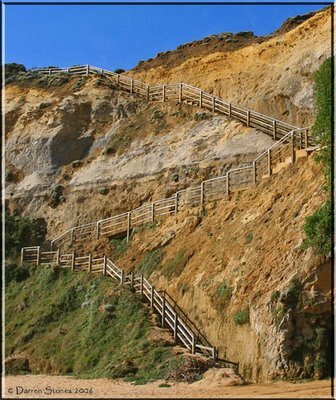 It can be a dangerous place at high tide and when the ocean is rough, it’s best to exercise caution before wandering too close to the waters edge due to freak waves that reach all the way up to the base of the cliff in many sections of this beach. Flotsam and jetsam are frequently washed ashore on this stretch so keep a keen eye out for something a little different from the norm as many ships pass just to the south of here quite regularly. From a photographic viewpoint, this location is one of the best around the area. 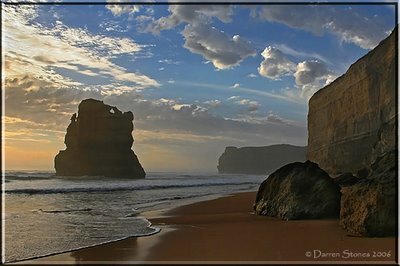 Sure most people go home with their customary quick grab images of the Twelve Apostles, but if you’re patient and have time on your side then you’ll be able to capture some gorgeous photographs of this spot. A wide-angle lens is probably going to be used more often than not and I’d highly recommend that a UV filter be attached to the front of it, as this is a renowned location for having to continually clean the front of the lens. Polarisers, neutral density and graduated filters are also very handy to have as you’ll be able to get creative and produce a myriad of different shots. All times of the year present a different lighting scenario and I’ve found that the late spring to late summer months to be the best as the sun is at its southern most point. 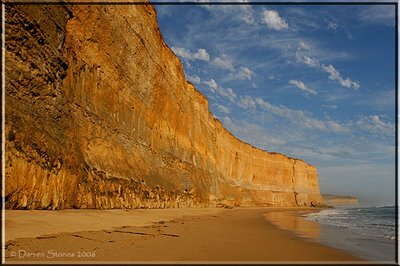 The cliff face is lit by the late afternoon sun and this presents the scene at its best in my opinion. Accommodation options in the region are numerous; however I’d suggest Port Campbell as the place to base yourself. There are motels, a hotel, apartments, B&Bs, a caravan park with onsite cabins and backpackers all within close proximity to the facilities you’ll require. What a great job you’ve done here, the pics are beautiful. Thank you very much for sharing this great place as I would love to see it but I don’t thing I will be able for a while and this give me the chance to watch it at its best. Are the two slide shows a series of continuous shots or a video? That is a great idea to present your work. Unfortunately I think my connection was a bit slow this morning so it was a bit jumpy. Thanks for the photo tips about the filters. I have read about the polarisers filter but I have never heard about a neutral density and a graduated filter. Well I am going up to Caloundra today so I better get ready. I had the full speed tonight so I had the chance to see the videos. As I was not terribly awake this morning I turned the volume up this evening, that answered my question if it was a slide show or not. I just had a glass of white wine and I feel happy. My day in Caloundra did not worked out as planned. I will let you know more about it on the Thomson Education forum as it is something to do with the course. Ps: I am going to pour myself and my wife another glass. Thanks for your kind words and good to hear you're having a couple of glasses for relaxation purposes. Sometimes the internet can be a little slow which is a bit frustrating at times however I'm glad you checked back in to see the small video clips that I've added to my site. I thought I should add some of my other works to my articles every now and again and the small videos are a good little grab to add for some light entertainment. Good to hear you're going to be published soon, and I take heart from that as I'm feeling confident you'll have further success. I'm feeling quietly confident that next year things will turn out okay for me as I've been putting in the hard yards behind the scenes for future success in writing articles. Look forward to reading about your Caloundra journey on the Thomson Education forums. These shots of the Port Campbell area are top class. Pity about the twelth apostle, I guess he sold his master for pieces of silver.